Ideologies are simple ideas, disguised as science or philosophy, that purport to explain the complexity of the world and offer remedies that will perfect it. Ideologues are people who pretend that they know how to “make the world a better place” before they’ve taken care of their own chaos within…. Ideologies are substitutes for true knowledge, and ideologues are always dangerous when they come to power, because a simple-minded I-know-it-all approach is no match for the complexity of existence. Ever since Jean-Jacques Rousseau, there’s been a war between “science” and tradition. (I put science in quotations because the science involved is often just ideology, and it keeps changing. Nevertheless the ideologues are always convinced that they have finally mastered all important knowledge, and are in a position to lecture the rubes). Intellectuals, basing their arguments on what they called science (often just a theory of science), have explained to their inferiors that all the old traditions and mores are the products of superstition – which we have now happily transcended. From this day on, we will base our actions and policies on “enlightened” ideas. And because science is infallible, utopia will inevitably follow. 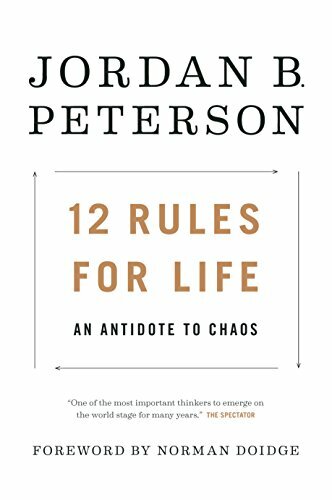 What Jordan B. Peterson does in the seismic book, 12 Rules for Life: An Antidote to Chaos, is to deconstruct such arguments through the application, not of religion, but of Darwinian biology – plus his extensive experience as a psychologist. He’s an open-minded thinker. He doesn’t rule out the possibility that the “old” rules of society might conceivably have a divine origin. But that’s above his pay grade. The evidence he cites is actual research in such fields as biology, anthropology, psychology, sociology, and history. His contention is that the traditional rules – which he considers the fruits of millions of years of evolutionary refinement – exist for a reason. He has distilled his list to twelve, and he explains why he believes in them. His book is fascinating, well-reasoned, inspiring, and sometimes moving. (There were some sentences that were badly constructed and confusing, needing an edit; that ought to be done.) Its naturalistic world view will be irritating to many Christians, but this isn’t a Christian book. This is a book about secular virtue. I read it in the light of Jesus’ statement to His disciples that “the one who is not against you is for you” (Luke 9:50). Absolute equality would therefore require the sacrifice of value itself—and then there would be nothing worth living for. We might instead note with gratitude that a complex, sophisticated culture allows for many games and many successful players, and that a well-structured culture allows the individuals that compose it to play and to win, in many different fashions.